I'm still kind of mulling over what I thought of this book, but overall I liked it. 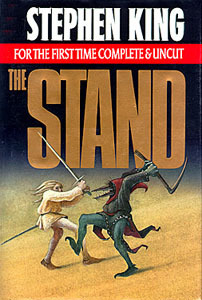 A classic premise of pandemic followed by a battle between good and evil gave a nice plot to the book. There were a lot of characters to follow, but not in the overwhelming Russian lit sense. Most characters were interesting and likable, including some on the "evil" side... I couldn't help but like The Trashcan Man. The only problem with so many characters was that it made the first half of the book move very slowly. Telling the back stories of nearly every character was a bit tedious, though not entirely unpleasant. I just found myself wishing for less detail and more action. Overall I enjoyed the book. Like I said, it moved a bit slowly for my taste but most of the characters provided enough depth to keep me interested. I found myself thinking about what I would do in the same situation and how I would handle everything. Kind of scary to think about. This was a long but worthy read and I'm hoping I can find and watch the miniseries now.